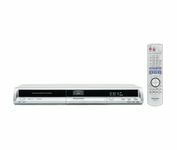 Panasonic DMR-ES25S DVD recorder can record and write to plus read and playback DVD-R, DVD-RW, DVD-RAM, DVD+R, DVD+RW discs. In addition, the DVD recorder is backward compatibility with other disc formats, which DMR-ES25S can play back, including DVD-Video, DVD-Audio, DVD-R (dual layer), DVD+R (dual layer), CD, CD-DA, and CD-R/CD-RW (including those with MP3, JPEG, and DivX files). CNet reviewed Panasonic DMR-ES25S and concluded with rating of 7 out of 10 that despite some problems with disc compatibility and DVD playback quality, the eminently affordable, well-featured Panasonic DMR-ES25S is the basic DVD recorder to beat. The good: Relatively inexpensive; HDMI upconversion to 480p, 720p, and 1080i; flexible recording length; excellent LP-recording-mode quality; SD card slot; FireWire input; 1-minute commercial skip. The bad: Unable to play back many homebrew DVDs; could not record to DVD+RW media; some issues with HDMI video playback quality; no IR blaster to control cable or satellite boxes.